* Indicates that these teams will move onto the NYC/Long Island Regional Championship Event at NYC/Polytechnic Institute on March 8. + The Island Bots were the first team selected to the Winning Alliance and will compete in the NYC/Long Island regional Championship (Please note: Team #7120, "Bionica" from Hewlett, hosted the event and will also attend the NYC/Long Island Regional Championship.) 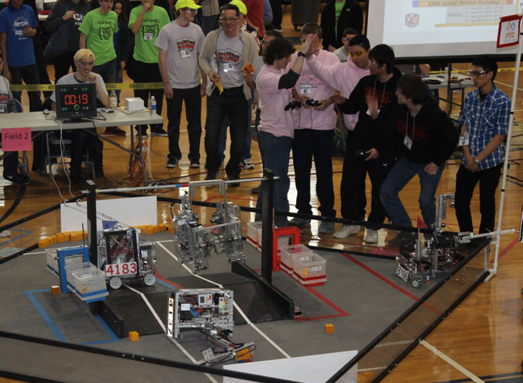 ++ Horace Mann was captain of the Alliance Finalist and will compete in the NYC/Long Island Regional Championship. Sponsors included Hewlett-Woodmere Public Schools, Rockwell Collins, FTC CAD and Collaboration, PTC, Merrill Lynch, Bloomberg, Con Edison, and Goldman Sachs and Friends.